I didn't prepare myself for this post as I'm not very keen on keeping my empty beauty products (aka trash) around. But, at the end of January, I noticed many products in my skincare stash diminishing at the same time. It's time for a classic beauty blog post: empties. Find out what are my final thoughts and would I repurchase! 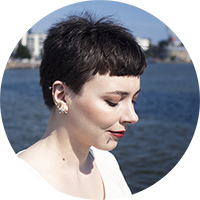 Verso is a Swedish skincare brand that has been popping up on Instagram and some skincare blogs, but I've seen fairly little reviews online. Intrigued by the star ingredient retin-A and the gorgeous packaging I purchased the eye cream. Later I generously received a couple of serums for review from the Finnish importer. The name 'Verso' confused me at first, because in Finnish 'verso' means a sprout, but later I learned the brand's name comes from Latin and means renewing. A good double meaning I say, too bad the brand isn't from my home country (haha). 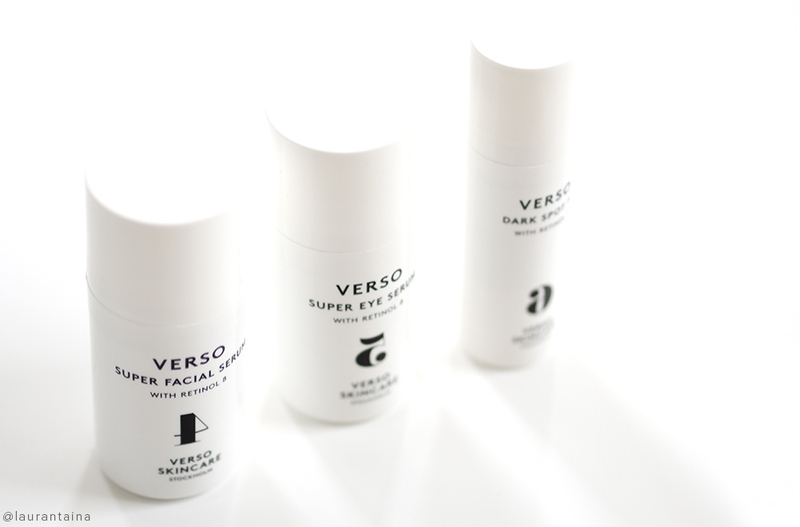 Let's take a better look at Verso's Super Facial Serum! This serum claims to be both healing and strengthening, aiding the skin's natural production of collagen and anti-ageing. Regular use should result in brighter look, improved texture and visible reduction of pigmentation spots and wrinkles. I decided to test the Dark Spot Serum later separately to see if the 4 Super Facial Serum alone would help with my skin concerns. Verso Super Facial Serum 30ml retails which retails £95 (Cult Beauty) or 119€ (Skin.fi, Yliopiston apteekki, available in various salons in Finland). As I'm writing this review I've put the serum to the test good 1,5-2 months. In a a couple of years I'll be 30 and I'd prefer if my fine lines wouldn't appear any faster. As anti-ageing is hard to measure, I was curious to see if there was any effect on my PIH or post-inflammatory hyperpigmentation aka "acne scars". You know, those red-purple spots you are left with after you've had a pimple. On my fair skin the acne scaring/PIH tends to be very prominent, depressing and takes months and months to heal. I could draw a face chart of myself and pinpoint where I have acne scaring, I've had to stare them for so long I know them by heart. 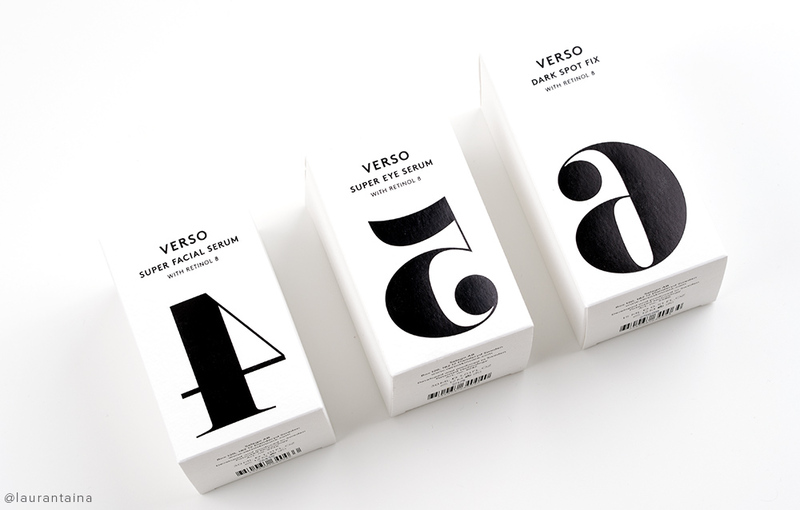 The Verso branding is a graphic designer's dream. Simple, clean typography and press images easily available on the website (I decided to shoot my own though). I love the typeface and clear hierarchy in the logo and product name, the numbers in the packaging imply the order of application. The graphic design gives a luxurious look to the uniform plain white pump bottles. However, I feel the pump is a bit 'cheap' - in the beginning you may have to press it multiple times to get any product out and deal with the growing panic have you gotten a dud. It doesn't feel very reliable to me, but after the pump is working, it does distribute the perfect amount of product for the whole face, which I enjoy quite a bit. Opaque packaging also keeps the ingredients from oxidising, which is great. I'm writing a comprehensive post dedicated to retinols and its benefits if you're completely new to the ingredient. Retinol/retin-A/tretinoin aka Vitamin A is scientifically proven to be an anti-ageing ingredient and found beneficial in treating multiple skin concerns including wrinkles, hyperpigmentation, skin firmness and collagen synthesis. They're available in various strengths both with prescription and over-the-counter. The con is retinols are often drying, irritating and proper sun protection needs to be applied. Verso's "Retinol 8" means their ingredient 8 times more potent than traditional retinol. I wish they'd announce the % in the packaging for the curious of us and not just "high concentration". Retinyl retionate, which Verso uses, is a photostable derivate of Vitamin A acid, which has a higher skin regeneration activity than retinol (source). Retinyl retionate has also been found causing less irritation than other retinoids (source) as induces more effective hyaluronan production, which causes less transepidermal water loss compared to retinol. These are all wonderful news to those of us who can't stand using retinol products without flakey skin. According to Verso the serum can be applied both morning or/and evening, but personally I've only tested it in my evening routine. I've used some retinol serums and behind the counter retin-A gel in the past, but I've always got a very dry, flakey skin after using them. Basic retinol serums have so low concentrations I haven't seen much results with them, but my skin won't tolerate 1% on daily basis. I've applied Verso facial serum every single night after my Vitamin C serum or current acid exfoliant with ~15 min wait time before and after to let the products sink in properly. No stinging, flaking or dry patches. Sometimes after application I do get a warm flush but no feeling of irritation. The eye cream, which I'm going to talk about separately, always makes the application area to feel hot. I didn't notice any difference to my texture issues while using Verso, but after my Accutane medication I've had zero break outs, which is hard for me to comprehend. When it comes to scaring, it takes the skin time to heal itself even if you get aid from products. I feel my scaring has gradually faded. I don't have the desperate need to pinpoint concealer some red spots that previously were visible from miles and miles away. I haven't noticed a visible difference in my fine lines, but they haven't worsen either. Longer term use will show, but I believe in regular use of retinol products. I think Verso Super Facial serum is an excellent retinol product, strong yet gentle. For the most sensitive of us, the retinyl retionate/Retinol 8 might be on the stronger side, but it's a product worth of testing out as the proven results of regular retinol use are fantastic. Verso is a very premium line, but I believe I'll purchase the serum once I've ran out. I'm very happy to find a non-drying and stable retinol product I enjoy!